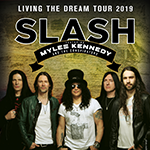 101.9 The Keg is proud to welcome Slash with special guest Myles Kennedy and the Conspirators to Stir Cove on Friday, August 9th! Get your tickets early on Thursday, February 7th from 10a-10p with the promo code STIRCOVE19. Public on-sale is Friday, February 8th at 10am.